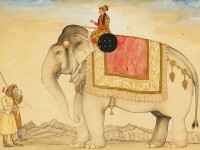 Male elephants periodically become frenzied during their mast (‘drunken, intoxicated’) season, marked by a discharge from glands in the temples and by aggressive behaviour. Wild-eyed and enraged, this elephant tears at his tethering chains while his mahout and keepers struggle to control him. 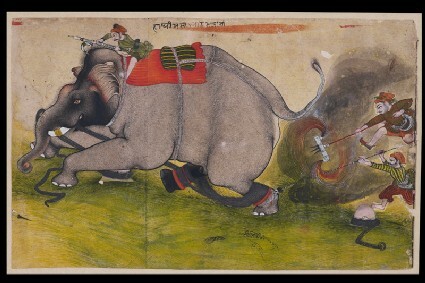 The surging contours and dense modelling of this elephant show a debt to the master of the previous painting of elephants fighting [LI118.62].